its speed changes for an instant at the time of loading. 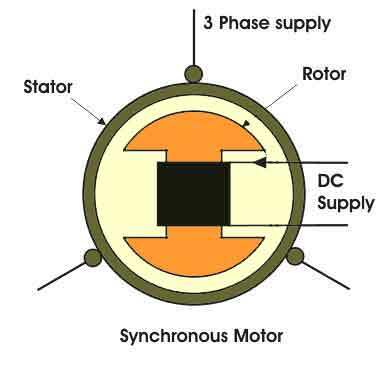 The single phase synchronous motor are further classified as reluctance motor and hysteresis motor. f = Frequency of the supply. assumed positive direction, in the vector diagram. Let ?1, ?2 and ?3 be the instantaneous values of the fluxes. The resultant flux ?T at any instant is given by phasor combination of ?1, ?2 and ?3 at that instant. Let us find out at four different instant 1, 2, 3 and 4 as shown in the Fig. 1(a) i.e. respectively at ? = 0o, 60o, 120o and 180o. Show positive values in assumed positive directions and negative in opposite directions to assumed positive directions. Hence vector diagram looks like as shown in The Fig. 2(a). BD is perpendicular drawn from B on ‘ ?T ‘. So magnitude of resultant flux is 1.5 times the maximum value of an individual flux. So ?1 is positive and ?2 is negative so vector diagram looks like as shown in the Fig. 2(b). So magnitude of the resultant is same as before but is is rotated in space by 60o in clockwise direction, from its previous position. So ?1 = 0, ?2 is positive and ?3 is negative. The vector diagram is as shown in the Fig. 2(d). a) The resultant of the three alternating fluxes, separated from each other by 120o, has a constant amplitude of 1.5 ?m where ?m is maximum amplitude of an individual flux due to any phase. The speed of the resultant is in space, for electrical of the fluxes for a 2 pole winding as discussed above. omechanical = oelectrical for 2 pole case. rotating magnetic field is Ns r.p.m. of the winding. In the example above the phase sequence is 1-2-3 i.e. phase 1 leads 2 by 120o and phase 2 leads 3 by 120o.